A reviewer’s life never gets boring! For Fitness lovers, life keeps getting exciting! And just when you thought your fitness wardrobe looked fancy, up to date and hipster chic, there comes Tech Fitness Clothing – C.VOX! I was presented the C.VOX Jacket – A New Age Running Jacket for walking/running/cycling and gym workouts! Something super fun! Clothing with Integrated earphones and 3.5mm connector in pocket to make life a lot easier (than we thought)! There is an internal wiring that connects the earphones (that neatly come out of the neck pockets) to the pocket of the jacket where you can easily connect the phone. So you attach your music device/ phone, put it in the pocket, and walk/run/cycle. It has a spacious pocket that holds my S7 nice and snug. Extremely comfortable headphones that come out of the neck pockets – I was very apprehensive about the ear phones falling out and me tucking them again and again. But three runs later I say it holds distinction! No falling out of earphones, no entangling of wires and super comfortable. Great sound quality – I am happily surprised that the sound quality of the embedded earphones is quite good, despite being washable. The sound reproduction is balanced and crisp. Superlight fabric and breathable – Which makes it an all season wear. Feather weight too. No more apprehensive about wearing it beyond winters and spring. it’s so light and non-sticky you are actually good to go with it in summers too! I know of enough people who like to cover up their arms in summers and this definitely can do the needful! In winters an extra layer inside will do the needful. and the same pocket turns into a pouch in which you can put the whole jacket. Jacket vs armband – This is interesting. In 2014 I ran my first half marathon with an arm band. In 2015, I ran the Pinkathon without an arm band not because I am anti-music, but because somehow my arm band wasn’t comfortable enough. I gave up on music altogether. I definitely prefer to go without arm bands now! If you look around you will see enough people who have stopped wearing the arm band. They are now on the flip belt or have stopped listening to music completely! Don’t want a jacket; want a tee-shirt instead? Don’t fret if buying a jacket is not on your radar! CVOX has several other styles to choose from for both men and women. Including several solid colors designs! 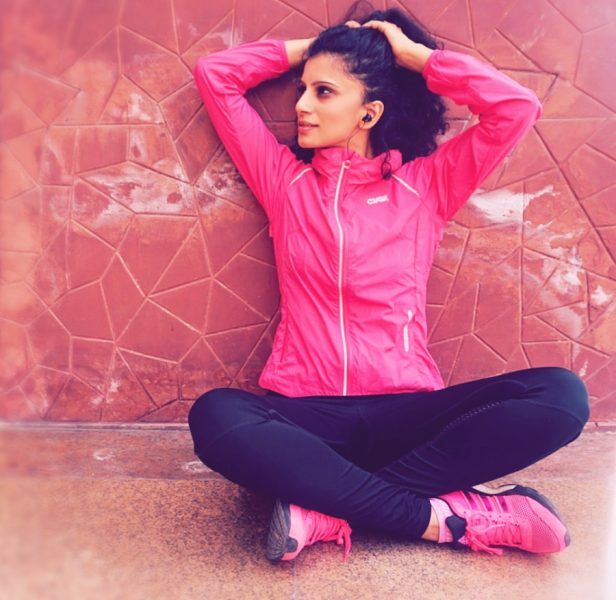 For the kind of trendy fitness clothing that comes with headphones and invisible wiring, this jacket that I am reviewing comes at a minimal price of Rs. 3500. The further game changers: Because there’s always room for improvement, the company is working on two things to make it the perfect fitness apparel! A phone holder inside the pocket which will make sure the phone doesn’t shake while you are running or working out! For all those who want to get rid of waist belts this can be a total game changer! For now, I am not complaining about my phone shaking in the pocket, definitely not on my long weekend runs and brisk walks! Though right now there is a mic in the Bluetooth jacket, it’s being added as a permanent feature in most of C.VOX clothing. Final Word – A novelty! Overall a great first time tech fitness clothing experience for me! Simple to use! Light to carry! It gets packed in its own back pocket to turn into a pouch. It’s the kind of stuff a common man wishes. A geek actually goes and makes it. You can purchase and check out their entire range on www.cvox.com, www.amazon.in and Sports Station CP store, Delhi. PS. The above is my personal review on the product. I chose my products that I review and associate with credible and reputed seller.